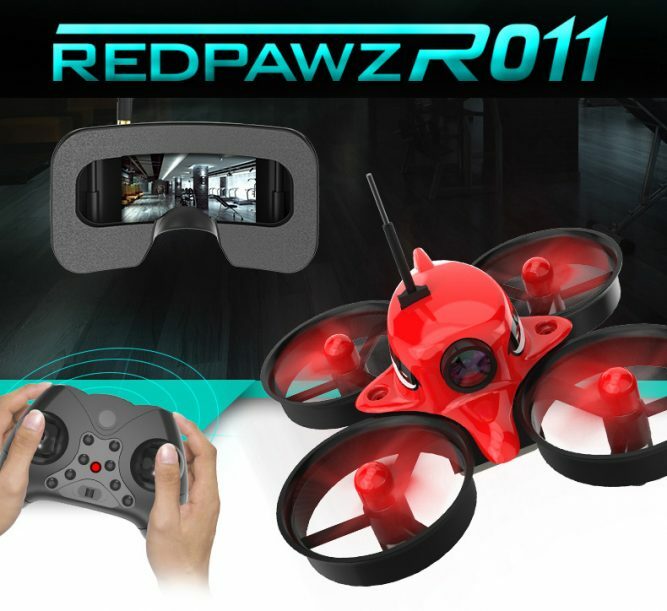 The Redpawz R011 Micro FPV drone is a great quadcopter for your entry into the world of FPV flying. The quadcopter features 1000TVL 120° wide-angle camera, one key return, 360 degree roll, headless mode, 3-speed option etc. The FPV goggles comes with a 3 inch high-definition screen, adjustable headband and comfortable padding allow for comfortable long view times. Here are some FAQs we gathered that may help you get to know about Redpawz R011. The remote controller cannot match code with the quadcopter. Make sure it’s the original remote controller. Check whether the battery is installed correctly. Check whether the propeller is installed correctly. The propellers does not working or runs slowly. Rebind the remote controller with quadcopter. Land the quadcopter first, wait three seconds and try flying. Motor and propeller tangle foreign matters. Battery power is insufficient (the LED light will keep flashing. ), recharge the battery. The quadcopter is unstable, shake or has loud noise in flight. Check whether the propellers, motors are installed correctly. Check whether the propellers are broken or bent. If it is broken or bent, replace a new propeller. Switch off the power of both the quadcopter and transmitter and then rematch code. Put the quadcopter in a horizontal plane and calibrates the gyros on the quadcopter. Check whether the A/B propellers are installed correctly. A transistor on the emission board in the remote controller is burnt out, and use a new remote controller. Make sure power supply to the goggles and quadcopter is normal. Make sure the receiving frequency is the same with the transmitting frequency. See if transmitter is working as normal. Make sure there is no other device nearby that is transmitting at the same frequency. The FPV system should choose other different frequency avoid interfered frequency in the same area. Make sure the antennas of the glasses and transmitter are installed correctly. Make sure there is no obstacles such as mountain, building, trees in front of the transmitter and glasses. Please use the FPV system in a wide open field.